Consistent with ISO vocabulary standards, each technical committee is responsible for standard terminology in its area of specialization. 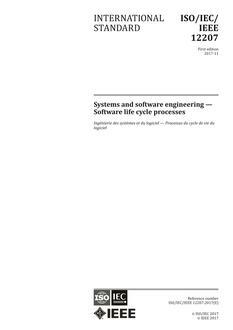 This document provides a common vocabulary applicable to all systems and software engineering work falling within the scope of ISO/IEC JTC 1/SC 7, Software and systems engineering, and the IEEE Computer Society Systems and Software Engineering Standards Committee (IEEE¿¿¿CS S2ESC). The scope of each concept defined has been chosen to provide a definition that is suitable for general application. In those circumstances where a restricted application is concerned, a more specific definition might be needed. Terms have been excluded if they were: considered to be parochial to one group or organization; company proprietary or trademarked; multi¿¿¿word terms whose meaning could be inferred from the definitions of the component words; and terms whose meaning in the information technology (IT) field could be directly inferred from their common English dictionary meaning. Revision Standard - Active. This document provides a common vocabulary applicable to all systems and software engineering work. It was prepared to collect and standardize terminology. 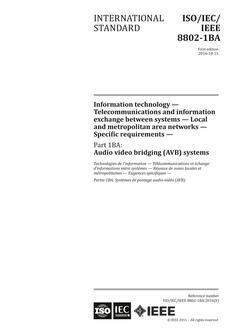 This document is intended to serve as a useful reference for those in the information technology field, and to encourage the use of systems and software engineering standards prepared by ISO and liaison organizations IEEE Computer Society and Project Management Institute. This document includes references to the active source standards for definitions so that systems and software engineering concepts and requirements can be further explored.